The premise is pretty simple. You (the user) move your arm, and the system tracks your movements and projects it to a robotic arm, mimicking your actions in real time. Realistically, this can be used to introduce the human element where humans can’t safely go, such as bomb disposal, battle situations, disaster relief. Unrealistically? Well, maybe you’ve heard of a little movie recently called Pacific Rim…I think that would be pretty cool. so as to avoid designing our own arm, which is more work than we want to do on the time restriction. 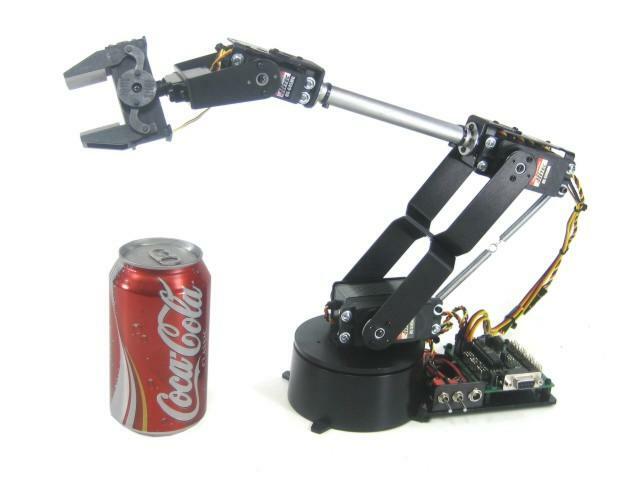 We’ve got an arm to control, but what’s going to be doing the tracking? That’s where the Kinect comes in. The Kinect is a incredible piece of technology. It’s got sensors out the wazoo, and Microsoft has a great SDK that goes along with it so anybody can make apps utilizing the Kinect. In particular, they’ve got a skeletal tracking library, which will enable us to detect and retrieve skeleton joints in 3D space. We will get (at least) all the major joints on the arm: shoulder, elbow, wrist, and turn the coordinates into the angles that the limbs form. These angles will get transmitted to a microcontroller that control servos on the arm. Now, look at the picture above, and look at what’s on the end. I want to take that simple claw, and instead put in its place an animatronic hand. By putting something more like a hand there, I’m hoping we can give this system more dexterity. Definitely not to the degree of our own hands, but at least more than the claw that the arm comes with. To accomplish this will take some creativity, since the Kinect tracking system we are using for the arm doesn’t have the resolution to track individual digits. 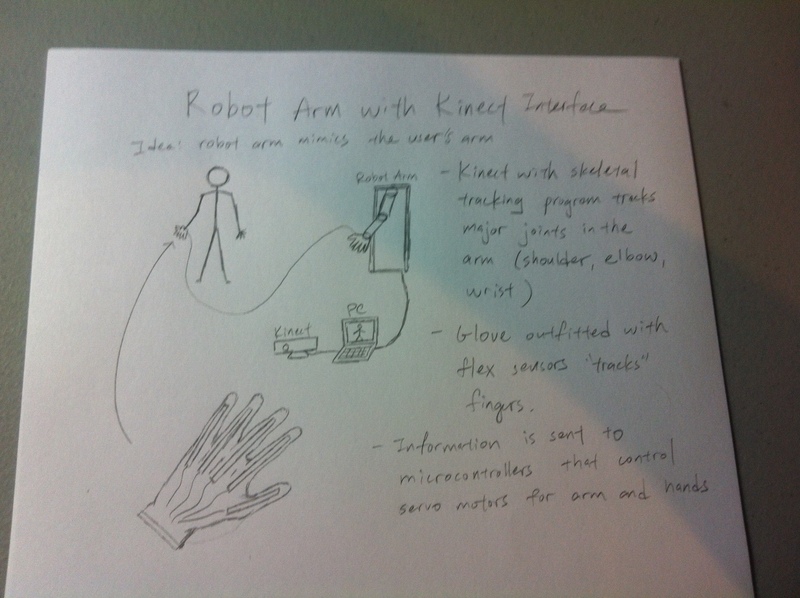 We are going to construct a glove outfitted with flex sensors over the fingers. As a finger bends, the sensor reading is read by a microcontroller and the microcontroller in turn controls motors to move the fingers. Like I said previously, this project is actually in progress already, so the next post will include the first update.